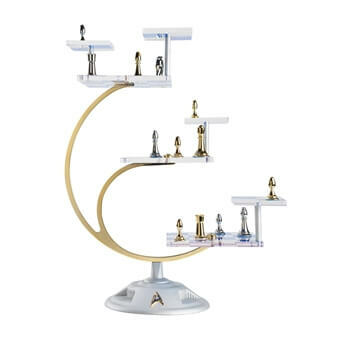 The Star Trek Tri-dimensional chess set is bold, distinctive, eminently logical, and has everything you'll need to start your intergalactic chess playing expedition. 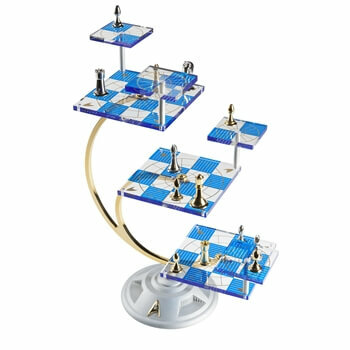 The 32 game pieces are precision cast and coated in sterling silver or 24 karat gold with three main playing boards and four moveable "attack boards." Complete with a specially designed collectible booklet containing the history of the game and the rules of play, it is a stunning showpiece, moving the Star Trek saga into a bold new dimension. This Star Trek chess set, from the Franklin Mint, is being released in honor of the 50th anniversary of the Star Trek TV series. The release is also timed in conjunction with the anticipated film Star Trek Beyond, the 13th film in the 50 year Star Trek franchise, being released summer of 2016. Since its inception in 1964, Star Trek has captured the hearts and minds of fans eager for a brighter future. The series' views and ideas have moved beyond the screen and inspired the world outside of Science Fiction. 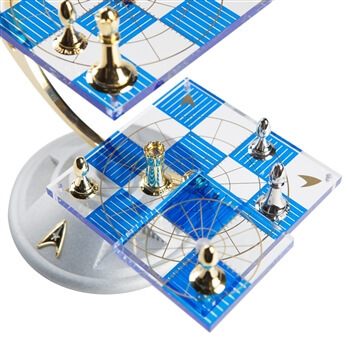 Since the debut of "Court Martial" fans have been fascinated with the Tri-dimensional chess set featured in the episode. There have been many pop culture references to it, including episodes of "The Big Bang Theory" and "Doctor Who."